Andy Flower, the England coach, has said the successful blooding of a new generation of cricketers in the recent one-day series against India will provide an extra incentive for his senior players in the Test team to build on the high standards they produced in their rise to the top of the world rankings. Speaking in the aftermath of England's impressive six-wicket win in the fifth and final ODI in Cardiff - a result which handed them a comprehensive 3-0 scoreline - Flower reflected that the international season "couldn't have gone much better". Nevertheless, he warned of the dangers of self-satisfaction creeping into the squad's mentality, and said any player who dared to rest on his laurels risked paying for that attitude with his place. "I am delighted with the way the summer has gone, but at the risk of repeating ourselves we don't just want to put our feet up and say, 'Gee, it's a lovely little time we have had together'," said Flower. "If people aren't hungry enough then I don't think they will keep up with the side. They will drop out or be dropped out. "The hunger is very important because it drives you to train harder, it drives you to get out of bed early in the morning to go training. It drives you to do the extra work and to do your skills practice. To keep the weight off your body. It drives you to be inquisitive about maximising your potential. "If there is any self-satisfaction or too much contentment it can take you into a dangerous place. Our philosophy is to look forward and at the challenges ahead as opposed to those behind us. If you do look behind you, you are not planning properly for the future." The dramatic arrival of the 21-year-old Yorkshire batsman Jonny Bairstow is a case in point. His nerveless debut innings of 41 not out from 21 balls not only secured a notable victory in a stiff run-chase in Cardiff, it served notice of the talent challenging for regular places in the England team, and reminded those players currently on the sidelines - Eoin Morgan and Kevin Pietersen among them - that competition is healthy. "I can't remember a debut like that," said Flower. "It was very clean and impressive hitting. Not many people can strike it as cleanly as that. Not many people are that talented. He should be very proud of his performance and it is great to make an impact in international cricket straightaway, but let's all keep level heads about it. Talk is cheap, but he did it with his actions, and he will continually be asked questions to repeat his performances out there in the middle when the pressure is on." As Flower suggested, Bairstow's "innocence" at international level may have helped him to shrug off the pressures of the match situation, and play each of his 21 balls on its merits. Though he wouldn't be drawn on specific matters of selection ahead of the tour of India next month, Flower used an analogy from his own playing days with Zimbabwe to highlight the situation that England have now reached, with so many candidates pressing their claims for places in England's various teams. "What it does re-emphasise to me is that opportunity is very important," said Flower. "When we were given Test status, I was a little skeptical that we deserved it as a Test-playing nation, but I thought, 'wow, what an opportunity'. I never thought I'd play international cricket. You've been given a chance, try to do something with it. These young guys have been given a chance and it's very interesting to see how they've done against similar opposition. 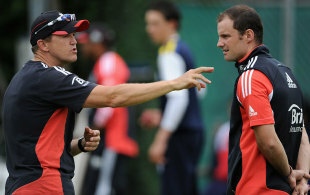 I think that's been very informative for everyone and very exciting for the future of English cricket." England's one-day campaign hasn't just been about Bairstow's performance. Steven Finn filled the void left by James Anderson and Stuart Broad in Cardiff with his best spell to date in one-day cricket, while Jade Dernbach has shown the potential to become a truly innovative bowler, even if he hasn't quite learned when to use his many slower-ball variations. Ravi Bopara overcame a torrid start to the series to produce key innings in each of the last three games, and Flower was delighted with the overall direction of his team. "The guys have been grabbing their opportunities, which is outstanding," said Flower. "We have got a little bit of exposure into Ben Stokes - it has been exciting working with him - he is an exciting young player and a really good young man. Dernbach has got more exposure and experience against a really good one-day side, so a lot of good things have happened. "We've won in difficult situations - it has been a really good series in that regard," added Flower. "We rested KP, we played Bell at No. 4, then through injuries other people have got chances. Finn, in the two chances we have given him, has been outstanding. His figures don't suggest so but he looked really exciting as a fast bowler and he is going to be an integral part of the England attack over the next few years. Bairstow last night got his one chance and grabbed it with both hands, and it was nice for Ravi to see it right through to the end last night." On a personal note, Flower was adamant that his own hunger for the England job matches that which he expects of his charges, not least having witnessed the sort of potential that has been displayed in the past fortnight. "I am excited," he said. "I have only been doing this job two-and-a-half years and a lot has happened - it is amazing how quickly things happen. When I was given the job I said I wanted to make a difference and I still hope that can occur in the next couple of years. I am very proud of the way the guys are performing and it is interesting to see how the three captains [approach] pans out. "I am sure most coaches are the same - coaches or captains - you shouldn't need motivation to play for your country. There are plenty of reasons to be motivated. It is more about channeling that energy and making sure it is organised and making sure, as far as possible, individuals are maximising their potential. I don't think it is so much motivation - it is more how we manage that. "The side is going to vary along the way but English cricket has good resources - both financial and human. There are proud cricketing nations out there that are just as hungry as us so it is going to be a good battle. We can achieve very good things. That was a very young side we had out there - Swann I assume was the oldest - so that is a very young side to beat India."